This year the antique Planet Jr. seeder finally took over from the Earthway, to handle most of the direct seeding. We’ve been using it for everything but tiny carrot and lettuce seed, where the lighter Earthway is easier to maneuver for closely spaced rows. Here, Lynn rolls out a third planting of beets, no problem. The PJ is heavy and initially hard to handle, but also more precise, uses way less seed than the Earthway, and lays down a well-packed row. And the choice of 60 or so seed holes, at first a pain, turns out to be a great way to appreciate variations in seed between varieties and fine tune seeding rates—we used three different openings to best fit three types of beet (Golden Detroit, Chioggia, Kestrel). It’s great. With this well-aged Planet Jr, old turns out to be our new and improved! Love the planet Jr. seeder and love the poofy clouds in the background! We have been using the earthway for a few years now and it has worked brilliantly..we thought..we realize now as you said it puts out way too much seed and the plates are never quite right. We are thinking of trying the six row seeder from johnny’s or the new european push..which looks similar to the one you are using now…any suggestions. Kate: In Tiny Farm Forum, there’s an interesting discussion of seeders that you’ll probably find useful. The Coleman 6-row is described, also the Jang seeder that people seem to like. I want to try both, just gotta fit in the budget. The Thilot (if that’s the Euro one you’re referring to) I haven’t yet heard/read about being used, so I dunno, it’s probably good, but also expensive at I think over US$1,000. But it could be great! From reading a comment about the 6-row elsewhere, along with what was described in the forum thread, I think a REALLY well-prepared seed bed is necessary, so getting the tilther as well may be a good/necessary thing. I’m basing that on someone who hated it after using it on a less-than-really-clean seed bed. That tool (machine?) is awesome! I love it! Beautiful photo composition as well! 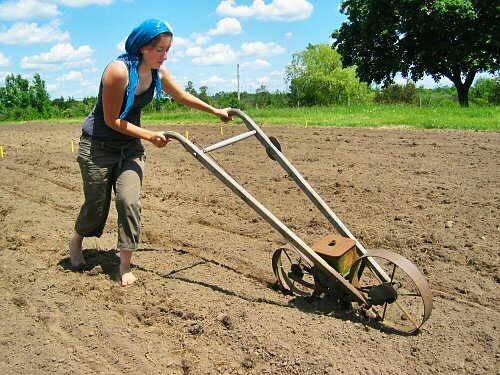 I love the fact that she’s farming in bare feet! I’ve never seen that before. John: Do a web search (um, Google, I guess…) for “planet jr parts”! Looks like there are a bunch of leads to try. Pingback: Earthway Precision Garden Seeder A.K.A. Salvation!!! I’m looking for parts for a Planet Jr No. 4 Seeder. Using it in a community garden. I need the large drive wheel & the arms that mount it to the frame. Anyone have a damaged unit they would like to get rid of ? Wondering if you use the planet jr or the earthway for sowing spinach. I’ve been using the earthway but it doesn’t perform well with spinach. Also, are you using pelleted carrot seed? We’ve been using the Planet Jr. for spinach for the last couple of years. It does great, saves a lot of seed over the Earthway. I use the PJ for most seed, now, it’s more accurate by far than the Earthway, uses way less seed in the process, and tamps down the earth more firmly because it’s so much heavier. There’s no problem with bigger seed like peas and beans, but I’m still a little cautious with the seed depth for smaller seed like lettuce and carrot. I still sometimes use the Earthway for small seed when I want to be absolutely, positively sure I lay down a lot of seed to ensure germination, and worry about thinning later if at all. I made the switch to PJ for spinach a couple of years ago when one variety, Spargo, that I’d been planting for a while, came in that year with at a much bigger seed size that didn’t fit the Earthway plate. Had no choice and it worked out fine. BTW, I’m still waiting to try the Jang Clean Seeder, that sounds pretty good. Jag har en sådan här gammal maskin. På ena handtaget är tryckt “Överums Bruk”. Har den inte på Webbsida men kan göra det. Can anyone tell me if the vintage Planet Jr. Seeders only fit with old seedplates? I found a really great No. 4 seeder- only one plate. Thanks in advance! I’m looking for parts for a Model 3 Planet Junior walk behind seeder. Have spent too much time using Google! Any leads, please, please. This morning, 29 Sept 15, I discovered an old Planet Junior Wheel Hoe Serial No 4426 in the basement of an old house in Marlborough, England. This is pure dead brilliant, serendipity as I was about to buy a Hoss wheel hoe from the USA ! Please can anyone tell me when this Planet Jr Hoe was manufactured ? It is in remarkably good condition and has pistol grip wood handles. The Planet Jr logo and decal details are all crystal clear. Still need to buy the modern Hoss accessories. Many thanks for any leads or info. In the UK wheel hoes are incredibly rare and rarely used. Not so in my case as this Planet Junior will be restored and put to work on my allotment in inner London. Our allotments are on the site of the old market garden which supplied produce to the Palace of Sheen which was knocked down in about 1500 AD. The market garden aka allotments continue in use.